Now that you know what not to do, how do we stop little Alexis as she unleashes her next natural disaster of a temper tantrum—whether she’s a pre-schooler demanding a new toy from the store or a teenager crying for the keys to the family car? Temper Tantrum-Taming Tip #1: Provide positive power. When we give our kids positive control throughout the day, they are less likely to end up thundering in the breakfast aisle because you won’t buy the newest chocolate and marshmallow cereal. Use choices to give your child control over his world: Should you read Where the Wild Things Are or Dr. Seuss? Milk or water with lunch? Older children can help plan family activities – like what restaurant you should all go to tonight. Temper Tantrum-Taming Tip #2: Be bored. When you’re in public and the whining starts, make it clear that you are totally unimpressed. Remember that your child may have a right to have a tantrum, but you have a right not to participate in it. If you can, retire to your car – even if it means leaving your cart – and let her wreak her havoc where it won’t hurt anyone (or their ears). Then resume your activity. When your child realizes she’s still not getting that cereal, she’ll be less likely to exert the effort next time. 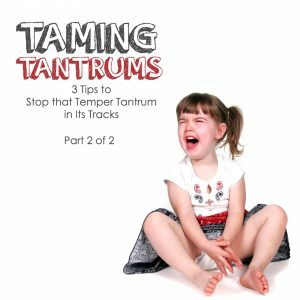 Temper Tantrum-Taming Tip #3: Restrain your reaction. The most important tool for dealing with a tantrum is to withhold the attention your child seeks – instead, provide no reaction at all. No words, no eye contact. If you can, simply walk away; a tantrum isn’t nearly as rewarding when you remove the audience. To seal the deal, though, you’ll need to take time daily to provide positive attention to your children. When they proactively get the attention they need, they’ll have no need to start yelling for it later. By following these tips, we are able to put a swift stop to Tropical Storm Alexis – and her temper tantrums – no emergency evacuation required. Providing positive power and removing the attention pay-off tames those temper tantrums and prevents future ones.